1.1 Upon acceptance onto the course an invoice will be forwarded to the student. This excludes students awarded bursaries or sponsorships. 1.2 A registration fee of £200 is required before the academic year starts. The registration fee is the first instalment of the tuition fees for self-funding students. 1.3 Students are not permitted to start a course without at least the payment of a first instalment. 1.4 Payment must be made within 28 days from the date of the invoice or before the first class, whichever is earlier. Fees are not reimbursable once the course has started. 1.5 Payment may be made in instalments by agreement with the Head of HR and Support Services. 1.6 Alternatively, a student may provide evidence that fees will be paid by an approved sponsor, in this case students must provide documentary evidence which acknowledges that tuition fees will be paid on receipt of an invoice. The College reserves the right not to accept such documentary evidence. 1.7 Where undertakings given by the sponsor are not honoured by the sponsor, the relevant student shall become personally liable for the total amount of fees outstanding. 2.1 A study-break is where a student admitted to a course of study, on completion of that year of study, advises the College in writing before the commencement of the following year’s study, that he or she intends to take a study break of one or more years. There is no charge for the study-break year(s). 2.2 Limits on study-breaks: Students who choose to take a study-break must complete all the work and submit themselves for award within the maximum time allowance for participation in the course. 2.3 Once students have reached the dissertation or thesis stage, if they do not submit their dissertation or thesis within the academic year in which they are registered and would like more time to complete writing they will be liable for a continuation fee. PhD students whose doctoral thesis requires major corrections and another examination panel will be liable for a continuation fee. 3.1 Current fees are published in the prospectus and will apply for the duration of the student’s course. 4.1 The College reserves the right not to re-enrol any student who has an outstanding debt to the College from a previous academic year. 4.2 The College reserves the right to exclude students from examinations and to have their qualification or award withheld and/or to prohibit them from attending any graduation ceremony if they have outstanding tuition fees. and fees during their studies abroad. Students experiencing difficulty with paying their College fees should immediately contact the Head of HR and Support Services who will be available to discuss the matter and to offer appropriate help and advice. 5.1. Early withdrawal before the academic year has begun: Fees will be refunded in full, less the application fee, provided students cancel within 21 days from signing the acceptance form. 5.2 Withdrawal due to ill health or other exceptional circumstances: Fees will be due for any semester started but not for any remaining semester of that year. 5.3 Withdrawal due to failure to obtain a student visa: Students must apply for a visa three months before they intend to enter the country. If having applied in that way and a visa is refused then the College will refund the tuition fees. A refund request needs to be submitted within 30 days of the visa refusal along with the relevant documents. 5.4 Disciplinary grounds: The College reserves the right to suspend or dismiss students without refund of fees in the event of serious misconduct or unsatisfactory attendance/progress. 5.5 Withdrawal due to the discontinuation of an award or unit: Fees will be refunded in full to fee-paying students, if the course on which they have received a place is discontinued. If a unit within a programme is discontinued, fees will be refunded in full provided that students withdraw before the course begins. 5.6 Transfer to another institution following unexpected closure of a course or programme after it has started: In the event that students transfer to an alternative institution to complete the course, the corresponding sum of tuition fees will be refunded. The students will be responsible for the arrangements with the alternative institution. If students are in receipt of a bursary from a sponsor they must make they own arrangements with that sponsor. 5.7 Payment of travel costs due to the unexpected relocation to an alternative site: In the event that students are relocated to an alternative site beyond London tube zones 1-3, the College will refund any additional travel costs that are incurred throughout the relocation period. 5.8 Withdrawal after the academic year begins: Fees will not be refunded once the academic year has started. A full year’s fees are due. Please note: The College prospectus is correct at the time of printing but it is subject to alteration. See document ‘Regulations for the Payment of College Fees and other Charges’ for full terms and conditions on all points above. Costs directly related to student studies: In addition to the tuition fees students must budget for, or have in their possession a laptop and install ‘word’ or an equivalent programme. They will also need to have access to the internet. Additional expenditure includes stationary and photocopying costs, with certain awards there will be additional costs for binding dissertations. While the College has an excellent library, many students also purchase books throughout their studies. The general cost of living can vary depending on individual students’ style of living and choices. Here are some pointers. Accommodation: Private accommodation for rent is available in the Finchley area and our recommendation is that students live in proximity to LBC where possible. Students are likely to pay between £150 and £200 a week for a single room (bedsit) with cooking facilities. Students often choose to rent flats together and share the costs. Utilities (gas, electricity and telephone) could cost about £30 a week. A limited number of scholarships will be awarded each year to those who, in the opinion of the admissions board, are likely to make the most significant contribution to the movements’ congregations or affiliated organisations. 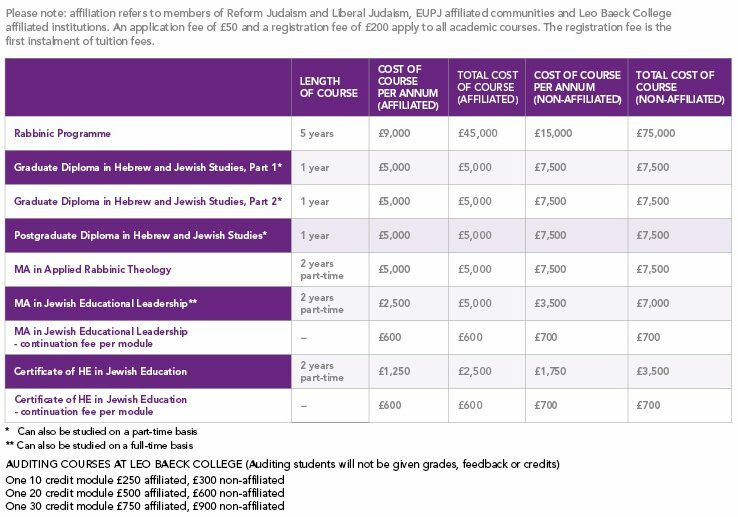 The scholarship covers fees and living expenses for the five years of the rabbinic programme. Students granted a Sponsoring Organisation scholarship are required to sign an agreement with the relevant organisation providing the funding. It is a condition of the Sponsoring Organisation scholarship that prospective students must, following ordination, serve for a minimum of five years in a Sponsoring Organisation congregation or affiliated organisation as rabbi, educator, youth worker, or similar role, unless there are no suitable positions available to the graduates. If the graduates enter into service but serve the Sponsoring Organisation for less than five years, the amount paid or credited under the scholarship shall be repaid pro rata to the number of years served. These may be available from external sources such as individual synagogues or from funds specifically donated to the College for this purpose (e.g. East European student fund). Funds are awarded from time to time for variable amounts based on either need or qualifications dependent on the terms of the scholarship. Students may apply for extra grants from other sources. Any such income or income received from employment will not affect the amount of a Sponsoring Organisation scholarship. The effect of such income on any other scholarship will depend upon the terms of that other scholarship. Where additional grants can be obtained by the College from other sources for a student who has been granted a scholarship, they will be retained by the College to offset the costs of the scholarship and the student will be required to co-operate by applying directly or by supporting the application on behalf of Leo Baeck College. Further details are available from the College.